Getting a new house is exciting, and chances are you’re anxious to move in, but first thing’s first! Before you take up residence, make sure your new home environment is properly cleaned. Many people are shocked at how dirty and unhealthy a house can be, even if it appears to be clean. 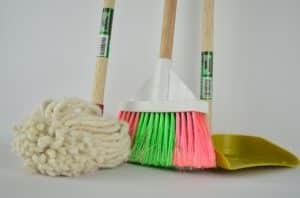 In fact, cleaning a home is a necessity before you get settled, and ideally, you’ll do a pre-cleaning before bringing your personal items into the new place. There is bound to be residual dirt and grime from the old owners, and packing and moving seem to take a toll no matter how tidy people attempt to be. Start your cleaning overhead, with ceiling fans, light fixtures, and crown molding, and work your way down to the floor. Vacuum and scrub storage areas and kitchen appliances inside and out, checking corners for cobwebs, grime, and dust. If you find something the former homeowners kept hidden, such as scarred hardwood or tiling, Bed, Bath, and Beyond suggests tending those areas with specialized cleaning products designed to help restore finishes. Floors should be vacuumed and mopped, and steam clean them if at all possible. While it may feel like a lot, you’ll likely notice right away how much grunge is lifting. Make it go faster by playing music or listening to an audiobook while you clean, and use a checklist to ensure you don’t miss anything. If it’s too much to tackle on top of packing, moving, and unpacking, let the pros knock it out for you. You can contact Extreme Air Duct Cleaning and Restoration Services to clean your entire home, inside and out and top to bottom. When you’re ready to move your things into your spotlessly clean home, take a thoughtful inventory of what might be tagging along. For example, if your mattress is more than five years old, there’s a good chance that it’s become a home for dust mites, bacteria, and other microorganisms. You don’t want to cuddle up with all those critters and breathe them in during the night. Think about starting fresh with a new mattress in your new home. Once you go to all the trouble of scrubbing your home, you’ll want to ensure it stays as clean as possible going forward. Unfortunately, there is more to your new home’s cleanliness than what meets the eye. In fact, houses can be home to a number of indoor pollutants, such as allergens, molds, and chemicals. American Home Shield notes some hazards occur naturally, such as radon gas. If you are concerned about radon, you can administer a test to check the levels. Some harmful compounds are emitted from upholstery, carpet, and paint. You should avoid bringing old chemical products into your new home, and ensure your home has proper ventilation. You should also develop a cleaning routine to minimize issues, especially if anyone in your household suffers with allergies. You can take steps to improve your home’s air quality with products such as an air purifier and adding an allergen reducer to your cleaning routine. Few people think about windows when evaluating in-home health concerns, but there are a couple things to keep in mind. If windows are improperly sealed, they can contribute to moisture levels being too high in the home, which can increase mold and mildew. Drafty windows can allow pollens, dust, and pollution into your home, so seal any cracks or crevices. The Spruce points out your window coverings can also be a contributing factor to poor air quality and indoor pollutants. Avoid heavy drapes that can trap tiny particles, as well as blinds with folds that can hold dust and bacteria. Choose something lightweight and easy to keep clean. Avoid letting lingering dirt and debris get you off to an unhealthy start in your new home. Clean thoroughly and keep up the good work after you settle in — and make choices that promote ongoing wellness. You’ll feel great in your fresh, clean, healthy new home!